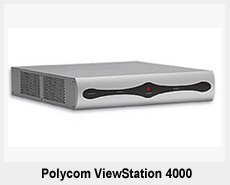 Whether your organization employs 5 or 5000, Polycom offers a ViewStation model that is best suited to fit your organization's needs. The ViewStation includes voice-activated switching (automatically focuses on the speaker, no matter where they are in the room), an address book dialer and a user friendly interface that makes it push-button-easy for anyone to use anytime. 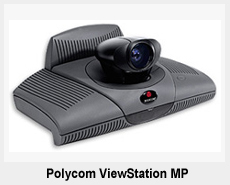 The Polycom ViewStation has a tremendous amount of power. At high bandwidths (512 kbps up to 1.922Mbps), the Viewstation delivers TV quality, 60 fields video, for an outstanding brilliant image and complete video motion. In order to meet a variety of meeting rooms, classrooms and custom integration configurations, each ViewStation model includes a full range of set top appliance conferencing systems which works across multiple networks including IP and ISDN . The ViewStation sits conveniently on top of any standard size display and each Polycom ViewStation is standards based and fully interoperable with existing video conferencing systems. ViewStation SP The ViewStation SP 128 and SP 384 delivers high-performance group conferencing in an easy-to-use integrated system that is ideal for small conference rooms, executive suites and professional offices. Both models implement the most advanced video technology for enhanced video conferencing quality and are fully interoperable with existing video conferencing systems. Small enough to sit conveniently on top of any size S-video or composite monitor, the ViewStation SP 128 supports up to 128 Kbps over ISDN and up to 768 Kbps over IP. The ViewStation SP 384 Supports up to 384 Kbps over ISDN and up to 768 Kbps over IP-based video conferencing. ViewStation 128 and H.323 For medium to large video conferencing rooms the solution can be the Polycom ViewStation 128 or the ViewStation H.323. The 128 runs over ISDN at 128 Kbps or over IP at 768Kbps. 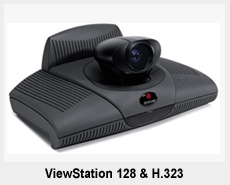 For those who want the highest speed performance, the ViewStation H.323 is exclusively configured over IP. ViewStation MP Connect up to four locations at once with the ViewStation MP, Polycom's medium to large videoconferencing solution to your business or organization. The MP supports ISDN calls up to 512 Kbps or IP calls at 768 KPbs and includes embedded web capacity and ethernet hub. 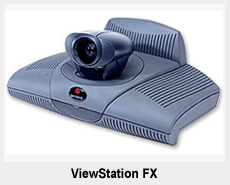 ViewStation FX The FX meets the demanding communication needs of classrooms, custom video conferencing facilities and executive boardrooms. With an embeded four port MCU, the ViewStation FX can call up to four site locations at 384 Kbps. It also captures and send meetings, presentations or broadcasts to anyone equipped with a Web browser. 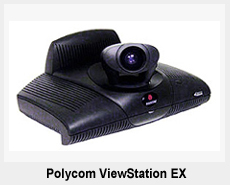 ViewStation EX With a medium price range the ViewStation EX supports up to 14 video and audio sites and can deliver quality video conferencing for your organization. ViewStation 4000 The rack-mounted 4000 incorporates the same great features and TV qualty video as the ViewStation FX, but is designed for custom integrators that demand the highest quality in video communications. The Polycom ViewStation 4000 can deliver a high-performance video conferencing solution for deployment in auditoriums, large classrooms and executive boardrooms. Polycom offers several ways to present and share data during your ViewStation multimedia conference. Whether you're working with a PC or Macintosh the Polycom ViewStation accessories (Visual Concert PC, Visual Concert FX, Polycom SNAP and more) has the inovative solutions that can save you time, money and enhancement to your presentations. From mission critical to mission accomplished, TKO has the tools and qualified employees to assist you in providing quality technical support, Training and Service Plans for your video conferencing systems. Whether you are a first time or a seasoned buyer, TKO is available to assist and provide your organization a cost effective system to fit your needs. TKO provides video conferencing equipment (Radvision, Tandberg, Polycom, Sony, Cisco Systems, AccessSwitch and more) as well as services and technical support for local, national and global video networks. TKO Video Communications also provides audio and video streaming, event management and satellite broadcasting. We distinguish ourselves from all vendors in the video communications industry by providing reliable and high quality video conference outsourcing, video solutions and products with unparalleled attention to our customer's objectives.